I shared a trading system with nearly 100% accuracy a few months ago. Whenever the Nifty ends lower for 2 consecutive futures and options (F&O) expiries and the total fall in it was more than 10%...it bounces back sharply in the third month. Nifty fell 13.76% in September and October 2018 F&O expiries. Immediately after the October expiry ended, I told my Profit Hunter Pro readers about the high chances of a sharp bounce back in November. The Nifty didn't disappoint. It ended the November 2018 expiry up by 7.24%. Now this time around I have observed something unique in the Nifty after the F&O expiry last week. It is different from what I've seen before. It's been a dull and boring expiry for the Nifty. It closed down by -0.36% in February 2019. This was third such listless expiry in a row. Nifty ended the previous two expiries in December and January with a change of -0.73% and 0.47% respectively. Now markets are not used to such lackluster movement. The Nifty moves sharply whenever it ends two or more consecutive expiries within a range of +2% or -2%. Have a look at this table. There were 3 instances (May-Jun 1995, July-August 2010, and May-June 2018) when the Nifty ended two expiries in a row within a range of +2% or -2%. It moved 6.79%, 10.08%, and 5.46% respectively in the third month. There were 3 instances (August-October 2002, August-October 2016, and April-June 2017) when the Nifty ended three expiries in a row within a range of +2% or -2%. It moved 10.33%, -7.54%, and 5.43% respectively in the fourth month. There was only one instance (April-July 2015) when the Nifty ended four expiries in a row within a range of +2% or -2%. It moved -5.61% in the fifth month. You will notice the markets have ended the last three expires (December-February 2019) within a narrow range of +/- 2%. The index has moved more than 5% in either direction in all the seven instances in the past. This indicates that chances of a big move more than 5% could be possible during the March or April expiry. Now there was only one instance when the Nifty traded within a range of +/- 2% for four consecutive months compared to three instances when it traded in a range for three consecutive months. So, chances of major move are higher in March compared to April. Now which way that move could happen is anybody's guess. But going by price action, as I showed to my Profit Hunter Pro readers here and here, it seems to me.. the chances of a fall could be higher. This could be the last leg of the fall before the markets bottom out and end the bear market of 2018-19. So in the short term, markets could fall but over the medium term, there would be many opportunities to pick fundamentally strong stocks at good prices. Are you ready to benefit from such a market? 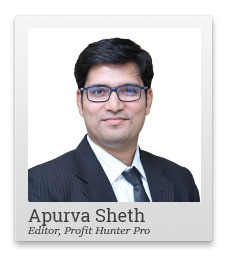 I have been recommending trading opportunities in fundamentally strong stocks to my Profit Hunter Pro readers for more than a year now. We have been successful at it. During this week, I recommend exiting from my recommendation in a fundamentally strong stock picked by Tanushree's StockSelect team - Oil India. I closed this recommendation on Wednesday with total gains of 8% in 15 days. I also recommended a new stock this week which offers a 'cash back' for buying it. Well not in a literal sense off course. But buying the stock is nothing less than buying a ₹ 100 note for ₹ 50. It also enjoys a healthy dividend yield of 6%. Best of all is its price action which suggests happy days are back again for this stock. Now the markets can move either ways in March but there are fundamentally strong stocks which are bottoming out after going through a bear market. These stocks offer the best trading opportunities in the short to medium term. Don't miss the opportunity in them. Equitymaster requests your view! Post a comment on "Are You Ready for the Big Nifty Move in the March Expiry?". Click here! 1 Responses to "Are You Ready for the Big Nifty Move in the March Expiry?"